The nearest beach, Playa de Piriápolis, is 5 minutes from Sugar Loaf with its white sands, calm waters, long boardwalk, and seaside restaurants. There are 23 kilometers of beach within the immediate vicinity, and hundreds of kilometers to enjoy within a half hour, and beyond, all the way to the Brazilian border. The coastal roads in Uruguay are perfect, so getting from one sunny spot to the next is easy. 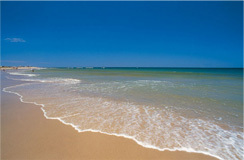 Each beach offers different characteristics to accommodate every type of water worshiper. Some have calm waters for leisurely swimming, while others offer superb surfing waves. There are places packed with beautiful people in bikinis, and others with not a soul in sight. The possibilities are unlimited. The beach at Punta del Este is the place to see and be seen. It is where the who's who of the Uruguayan and Argentine rich and famous hang out during the summer.